Asrai.org • View topic - Short Story Competition: THE END OF THE END!!!!! Short Story Competition: THE END OF THE END!!!!! We're giving the Warhammer World a final send off over at Druchii.net. All are welcome to tell their part in the final tale! This is The End. The fields of Naggaroth have been salted, the towers of our once impregnable citadels thrown down and our estates and cities abandoned. The Vortex has finally unravelled and ancient ancestral Ulthuan is now gone beneath the waves. Morrslieb, the ill-moon itself, has fallen from the skies in catastrophic fragments, showering the world with warpstone conflagrations and laying apocalyptic waste to what once was verdant Lustria. 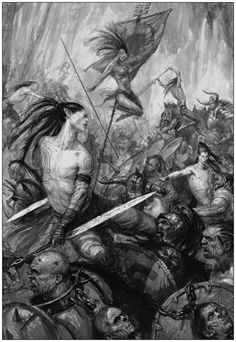 Far to the east, the last of Elves and Men and Dwarves fight bitterly against the ascendent powers of Chaos. It seems like the final chapter in the long saga of the Warhammer World has arrived ...and we are living it! But what of the great unmentioned heroes? How have they struggled against this cruelest vicissitude of fate? What of Skaw the Falconer? The might host of Iolair Gilandiril, Eponandilas Horse-Friend, Fildrigar Trueflight and Aesilanan Woodmage? Scarloc and his famous Archers? [*]What of the mighty leaders that head your Army? Tell us the tale of your heroines and heroes in this, The End of Times. ...is it really the End? ...or is it actually a New Beginning? Feel free to drop into D.net to tell us a tale of your army, or a major unwritten character. All are welcome, not just Elves! Re: Short Story Competition: THE END OF THE END!!!! !